Weekends are a chance to catch up on a few things around here. However, I've learned that it does no good to race around trying to accomplish too much. At the very least, I do the laundry, clean the bathrooms, and do a quick vacuum of the floors. Meals are taken leisurely, for the most part. If I feel like cooking, I do, if I don't, well, there's plenty of stuff in the freezer that's easy to heat up. This weekend was a combination - some cooking, some freezer items. Saturday breakfast was baked eggs with Brie and prosciutto. On Saturday night we invited children and grandchildren over with the express purpose of helping to whittle down some of the holiday appetizers that still languish in the freezer. Soup and appetizers was the menu, along with a tray of cut up vegetables. Tulips are in the stores now, and I can't resist picking them up. These are fresh and just beginning to open. Such a pretty shade of pink. The glow of twinkle lights on the mantel makes me feel cozy and warm, closed in by comfort. On Saturday evening the wind rose and howled around the house throughout the night. I awoke often as gusts clattered against the windows. Sunday, the wind eased, and we went for a walk in the afternoon. Just as we reached the furthest point from home and were beginning the return part of the loop, rain fell. Hard. We arrived home drenched, very happy to change our clothes, make some hot tea, and lounge in front of the fire. Comfort, indeed. Very hygge-ish. Last week's leggy tulips have been trimmed. The mosaic is composed of photos taken throughout the week, from tightly closed buds to wide open blossoms. Sunday evening's dinner was a pan-fried salmon filet with spinach, roasted vegetables and couscous. Quick and easy. All in all, it was a satisfying weekend. How was yours? Linking with Mosaic Monday, hosted by Maggie from Normandy Life. Weekends really should be for taking it easy. We had howling wind several days ago, too, and that's when the dust settled in. It's been hazy ever since. I'm being inventive with what I've got in the fridge and freezer. Trying to use what we have instead of running out to buy more. Good idea to have a soup and appetizer get together. :) Have a good week. Your weekend sounded lovely, even the sudden rainfall, as it led to a cozy change of clothes and pace! A great idea having family over for those holiday leftover snacks, your table looks warm and festive. A little reminder of all the celebrating a month ago without the craziness. Stay warm and dry! We are rainy and foggy here and its a bit different! Your weekend does sound like fun. Our Saturday was rain rain rain so we went grocery shopping---out of the house but still under cover and Sunday we patched up the front fence that has been knocked whacko by the high winds we have been having. We patched but the bigger job will have to be in better weather. The baked eggs looked very appetising, I am thinking of something similar for lunch. We too had a quiet and restful weekend. I now feel the need to get some tulips in the house. What a lovely addition they would be at this time of year. Your collage is really lovely and the menu for the weekend sounds delicious. Your tulips have lasted well! I'm fighting a cold so I stayed in and read Saturday. Off to church and lunch on Sunday. Your baked eggs look delicious. Love the tulips-it is a nod towards spring when I see them in the stores here. This is the worst time of year for me- holidays past and a long cold spell ahead of us until April or May. Apart from getting caught in a downpour I would say that was my idea of a Hygge weekend with an added touch of Lagom, eating simple dishes and depleting the freezer stash, for good measure. This sounds like a perfect weekend. The baked eggs look SO good. I too am loving the tulips. Have a happy Monday! Tulips are so pretty and your room looks very hygge ish! We don’t have s separate freezer so it’s scratch cooking here most days.... the wind kept me awake for hours. Spent a few hours knitting in my cozy living room on Sunday. Lorrie - the baked eggs dish shouts 'appetizing', but the lavish butter on the toast really got my attention! I have tulip envy, especially the soft pink variety. We had a pleasant weekend - the 'to do list' on Saturday and then a full day of skiing yesterday. Taking it easy today. The tulips are beautiful! And how nice to invite family over for your goodies! I had a good weekend...at times strange but overall good! heehee! We hiked both days since it was so nice outside! Enjoy your week! Hugs! My weekend was rush around and doing too much. Just going to put in my planner to have a satisfying week-end, next week-end and to treat myself to tulips. Sounds divine. Breakfast of baked eggs with Brie and prosciutto looks extremely tempting. Sounds like a perfect weekend and what a breakfast! Such a nice way to re-charge for the coming week. And the tulips are a wonderful way to keep the weekend memory fresh on your mind. Sounds a very nice weekend, and breakfast of baked eggs with Brie and prosciutto looks yummy! Love your tulips and that mosaic looks beautiful. Looks and sounds like a very satisfying weekend for sure. Those baked eggs look delicious. Thanks for some signs of spring in the midst of this rain and greyness. Oh your egg and cheese breakfast looks delicious. I haven't seen tulips yet but probably will this week when I go to market. They are always so pretty on a mid-winter afternoon. What a civilized and restorative breakfast, and tone for the whole weekend. You are always inspiring. Such pretty tulips! I also had a leisurely weekend and binged watched on the new season of Grace and Frankie. Lorrie, sounds like a wonderful weekend to me! 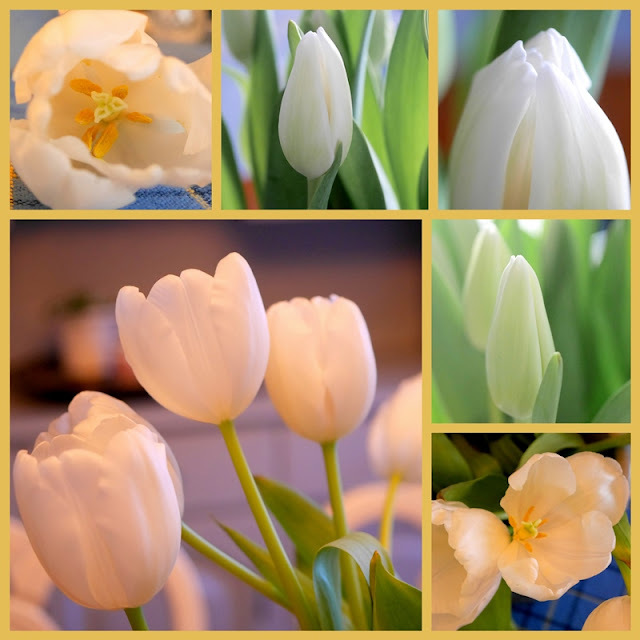 I love the way you photographed the tulips at every stage. My Saturday was spent playing with my grandson, the best kinds of day. Love the tulips soooo much. I have the same water glasses as I see on your plaid blue tablecloth. So pretty!! I think you have arrived at a wonderful balance of weekend activities! I have not bought any flowers yet this winter, but your cheerful tulips are making me think "soon" . . . Your weekend must have been wonderful with a houseful of dear ones to enjoy your freezer treasures. We had that kind of weekend too with my brother in law, son and husband working hard around the family farm to make some necessary repairs. We had the best ever lasagne on Friday night but I have learned not to fill the pan to th every top. Oven cleaning is the next step. Lovely tablescape Lorrie! Sounds like a very pleasant weekend. The tulips are pretty. Reminds me spring is just around the corner. There really is something very gemuetlich about your home and way of life. Baked eggs, tulips, family, and a walk on a windy beach, I can’t think of anything better. Your breakfast looks so delicious. We used to do a simple evening meal like this some times, though not for a long time. The tulips are simply gorgeous. Have a fabulous week and thank you for visiting my blog this week. I also cannot resist tulips when I seem them, they are so luxurious in their velvety beauty. And speaking of irresistible, your baked eggs look yummy, Lorrie. Sounds like a perfect weekend (or a perfect any two days for elderly people like us) except for getting caught in the rain -- but what a lovely way to warm up after! Beautiful tulips and Saturday breakfast looks scrumptious. Here in Florida, I do try to do something fun for breakfast on the weekend, because other days it is light and quick -- not so much because we're busy, but for health reasons. (In Oregon, we go out for breakfast a couple of times a week because we can walk to so many decent places with healthful menus). I love your pink tulips -- pretty soon they'll be growing in your yard and I'll be so envious!! I'm so thakful it's tulip month and days are only getting longer now.